Officers in Craigavon named him Nigel after stopping him when they found him running around the streets at around 3.30am in the Ashleigh Crescent area while on patrol of the Avenue Road area. But they said Nigel didn't want to play ball. In a hilarious Facebook post officers said: "He was subsequently arrested for jay walking, disorderly behaviour and 2 counts of assault on police. He's got serious anger issues. "Normally I'd make a joke about keeping him as a new PD if no one claims him. Not Nigel. He's an angry wee man and is seriously anti police." The dog wasn't wearing a collar and seemed to be coming from the Avenue Road towards Orient Circle or Carrick Drive. Police issued an appeal for his owners to come forward - as they joked about their fear of the tiny terror. "Please...find his owner. I like my fingers and don't fancy their chances if he's here another night. He's currently sleeping on my jacket, which I have a feeling he's not going to let me have back. "Share this or tag any chihuahua owners you know. The incident number is 173 of 19/04/17. The owner will need to call up the station to get him...soon...please..."
They added: "By the way, in this photo he's in the drivers seat. MY seat. He chased me out of my own police car. Angry wee so and so. Of course, the main thing is that Nigel is safe. The roads are no place for a wee lad like him to be wandering at 330am." 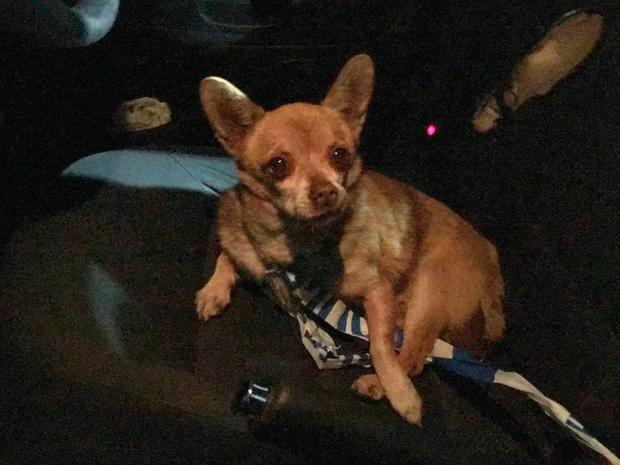 On Wednesday afternoon he was reunited with his owners. PSNI Craigavon added: "Good news. Nigel, aka Simba, has been picked up and is away home. "He certainly wasn't feeling the love tonight. "Thanks for the shares to spread the word and get him home. Facebook wins again." WATCH: Is this the cruelest prank you could play on a music fan?